I just finished reading ‘Ups and Downs – the economic and cultural impact of file sharing for music, film and games’ (see my earlier post for context). All in all the full version does not contain a lot of surprises when compared to the executive summary (which my first post was based on): It is a well written report that, although it makes a lot of sense to someone familiar with the subject, does not really come up with much new insights either. The strength of the report is that it places file-sharing within the wider social and economic context (as opposed to placing it solely within the economic logic of the entertainment industry). While they sometimes appear naive (it does not seem to occur to them that buying CDs or renting DVDs from the video-rental-shop is rapidly becoming obsolete from a technicals point of view) the researchers do seem to have a fairly good understanding of what is going on. figure 6.1 from ‘Ups and downs’ – blue boxes and grey arrows and labels mine (personally i am a bit surprised by the relative amounts of lazy and smart peple implied by this figure. life experience tells me to expect the opposite distribution). The orange block represents the revenue generated by selling recoded music in the absence of file sharing, which equals the maximum possible revenue for the recording industry. In this situation the rich people(a.k.a stupid people) profit (save money) because they would have been willing to pay more than the market price. All the people to the right of the orange colored block simply could not afford to buy recorded music. With the possibility of file sharing available to consumers we see a shift: a certain amount of people who used to buy recorded music now download it for free (‘cheap people‘). In addition the smart people (a.k.a poor people) now have the same access to recorded music as all the others and finally there also is a group of lazy people who simply cannot be bothered to download because they perceive the process as too burdensome. When comparing the changes between (1.) and (2.) in economic terms the researchers conclude that while there is a negative impact on the recording industry (caused by the cheap people) the fact that the smart people now also have access to recorded music represents a much bigger increase in economic welfare (and does not hurt the recording industry as it is ‘demand without purchasing power’ that is being met)1. As mentioned in my earlier post the researchers value the damage to the recording industry at a maximum â‚¬100 million p.a while they value the socio-economic gain caused by the increased access to recorded music at at least â‚¬200 million p.a. Personally i am not sure if this will be of any consolation to the recording industry, but as far as i can see it is a fairly adequate description of the current transformation process: A business model anchored in an outdated means of distribution is (partially) being replaced by a social practices that are (a) more in line with the technological state of the art and (b) provide greater socio-economic benefits to society at large. For the rest the report does not contain much news: Chapter 3 (‘the legal framework’) gives a solid and up to date (it even includes last years legislative battle around the EU’s telecom review) overview of the legal implications of file sharing (in the Netherlands) and Chapter 5 gives an overview of recent studies on the economic impact of file sharing2. Apart from the economic model described above chapter 6 also lists a number of ‘dynamic and indirect’ effects of file sharing that are fairly obvious but nevertheless worthwhile to repeat: The researchers argue (p.123) that while it is likely that file sharing hurts big successful artists (as cheap people will buy less CDs from them) it has a positive impact on smaller artists (as it allows more people to sample their works, which will turn some of these people into buyers of their CDs or make them attend concerts). More interestingly the researchers also argue (p.125) that acceptance by consumers of the substantial increases in ticket prices for live-concerts has to be seen in the context of file-sharing: The increased willingness to pay high prices for concert tickets may be due to the fact that consumers are aware that they are spending less on recorded music (or the other way around: as they have to pay more for concert-tickets consumers are less willing top pay for recorded music and resort to file sharing). When it comes to their conclusions the researchers note that file-sharing is here to stay and that we (the recording industry) are beyond the point of no return: It is impossible to build a successful business that is solely based on trading recorded music. According to the researchers is is also highly unlikely that there will be a point in the future where all music will be obtained from authorized sources (p.136). Given this they argue (inter alia, their official recommendation comes down to a pathetic paragraph where they make a plea against criminalization of end users and for more awareness building among file sharers) for a model where internet service provides offer internet subscriptions that include a fee for the access to copyright protected content (a.k.a the content flatrate). note how the rich people profit in both scenarios: they always pay less then they could (or should). this is probably why the distribution model the Nine Inch Nails used for Ghosts I-V worked so well. Chapter 4 ‘Downloading in the Netherlands’ is a bit of a disappointment. 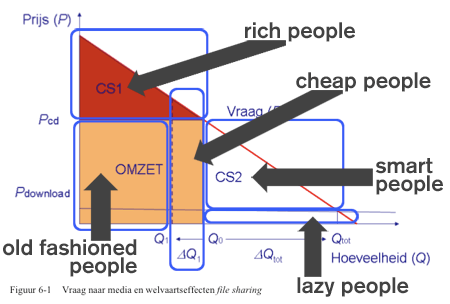 If presents the results of a representative survey that was conduced (by an external research-firm) among Dutch internet users. While the researchers repeatedly mention that the survey shows that file sharers have no clear understanding of what they are doing the data presented by them also underlines that the researchers (or the company contracted to carry out the survey) lack a clear understanding of their research object: see table 4-9 (usenet and newsgroups are two synonyms for the same source of files) or table 4-13 (most sites listed as sources for paid-for downloads do not offer downloads to users based in the Netherlands). Given this Chapter 4 casts a shadow on the otherwise high methodological standards claimed by the research team. This entry was posted on Monday, February 2nd, 2009 at 10.03	and is filed under intellectual property, politics. You can follow any responses to this entry through the RSS 2.0 feed. Both comments and pings are currently closed. In Australia I believe that sites like The Pirate Bay and others have been able to gain a foothold because the prices that the industry charges and the service it offers are not always set at a free market rate. Copywrite acts as a hinderance to the free market, though one that needs to exist in some form. While file sharing sites like 4shared will help the industry as they grow by bringing file sharing into the mainstream.